Earlier this week I posted a recipe to a “soup” that we enjoy making every fall/winter. 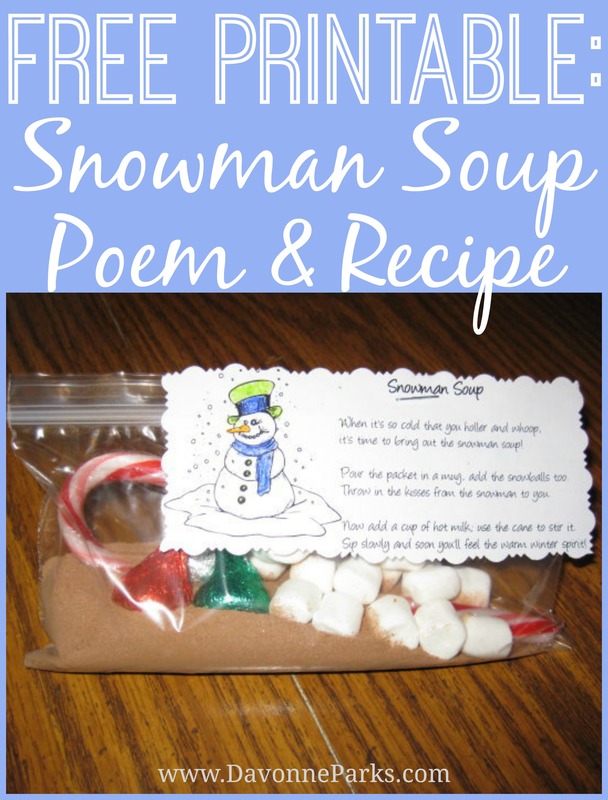 Below is a free printable of the poem we use for our favorite way to drink the snowman soup (AKA: hot chocolate)! Just click the image below to open the printable as a PDF. Can you do a second download page editing kisses for buttons? We can’t readily get kisses in the uk but we can get chocolate buttons (for the snowman’s tummy). Yes, Dee, I’ll be happy to! I’ll update this article with a UK printable and e-mail you when it’s ready. Thank you for your request! I don’t know why, but when I try to print off the UK page, the title Snowman Soup is mostly gobbledygook, with only the two Ss, the n and the m visible. The US version works fine. Any ideas? Thank you! Julie, this appears to be a driver issue on your printer with the font that’s being used in the UK version. I will re-upload with a new font and we’ll see if that helps! You’re welcome! The article is updated with a new version for you to print!